Posted April 11, 2013 . Highlights ARC, Core Data, MySQL, Native iOS SDK, PHP, Storyboarding, Usability, UX. 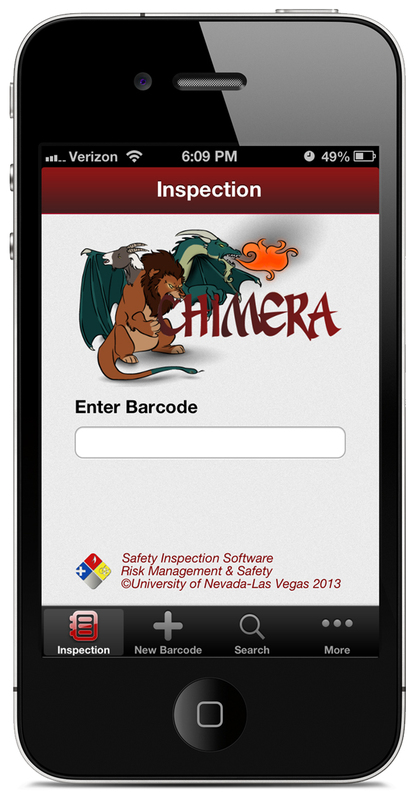 I built Chimera:FEq from the ground-up for UNLV Fire and Life Inspectors to inspect and maintain Fire Extinguishers, AED’s, Showers, Eyewashes, and Kitchen Hoods. It was slightly modeled from Chimera:FLS. Through this app, I was able to learn a lot about mobile development and usability. 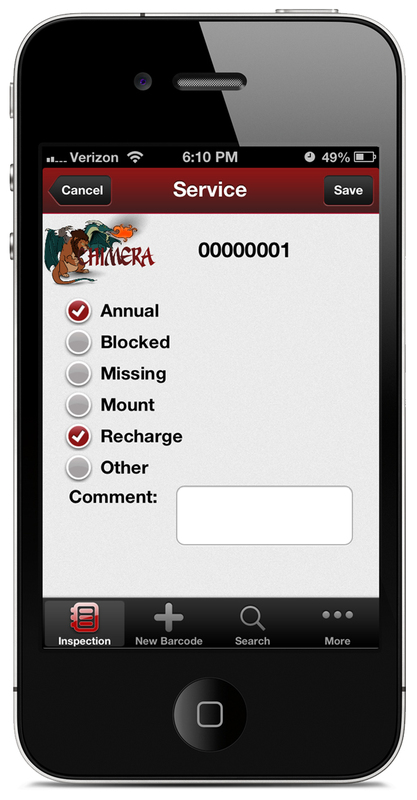 The previous Chimera series of apps didn’t have much reliability, usability and overall good user experience. When the app starts, the app is ready and waits for the inspector to enter a barcode. Barcode can be entered by hand or by a bluetooth scanner. If the entered barcode does not exist in the database, the inspector is informed. If barcode exists, the app automatically loads the equipment information the barcode is assigned to. The information of an equipment typically has building and room information. The comments block is also typically there but it’s optionally used. For each type of Fire and Life equipment, there are optional fields. 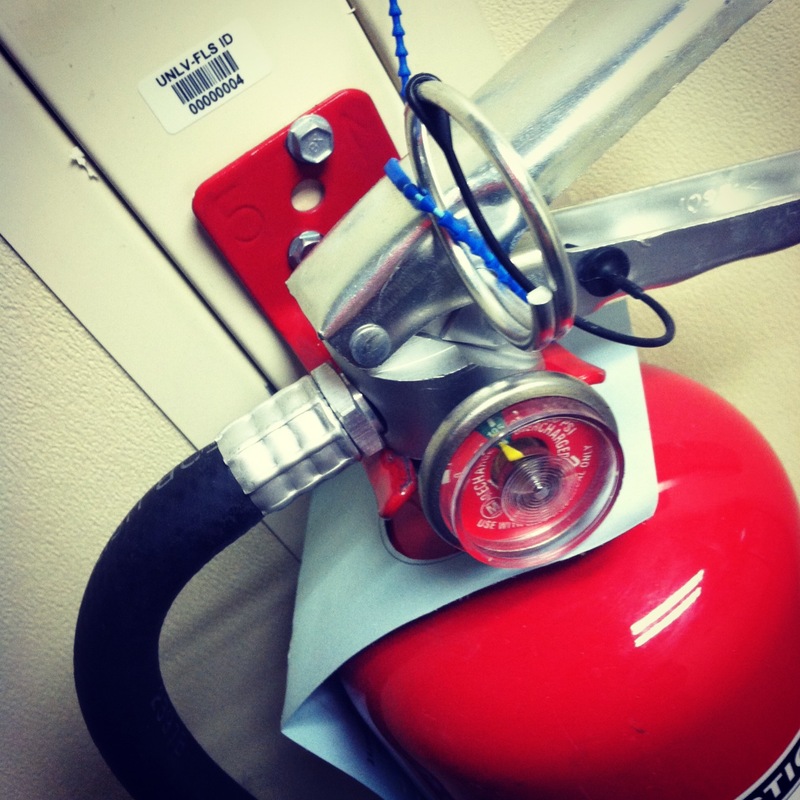 In the picture, the information is about a fire extinguisher that has an annual inspection date, size and type. For an AED, the brand, Serial number, battery date and pad date. For Showers, just a type. For Kitchen hoods, just a cleaning date. The information can be edited and saved for all inspectors to have a shared information. This form has a lot of checking to make sure the inspector fills out the required fields before any updates are saved. Inspectors can add a new equipment. In other words, they can add another fire extinguisher, shower heads, eyewash or kitchen hoods to their database. The app enables inspectors to file a service request to other departments. The service options are dynamically rendered since services are different for each type of equipment. The service options are handled in the admin interface. The admin interface is a content management web version built using PHP and jQuery, which I also built from scratch. Chimera:FEq has a synchronous API (as opposed to the ideal asynchronous) since the UNLV campus has unreliable network coverage. 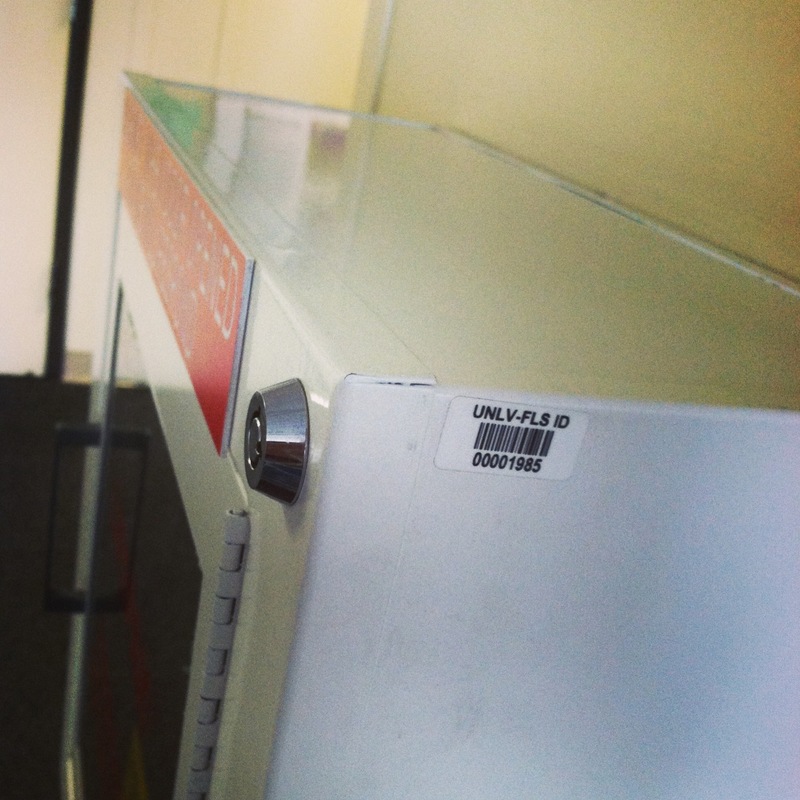 While UNLV has many routers everywhere, the app can loose it’s connection randomly because while inspectors move around, the routers will fight over the device’s networks leading to unreliability. 3G was costly so it wasn’t an option. 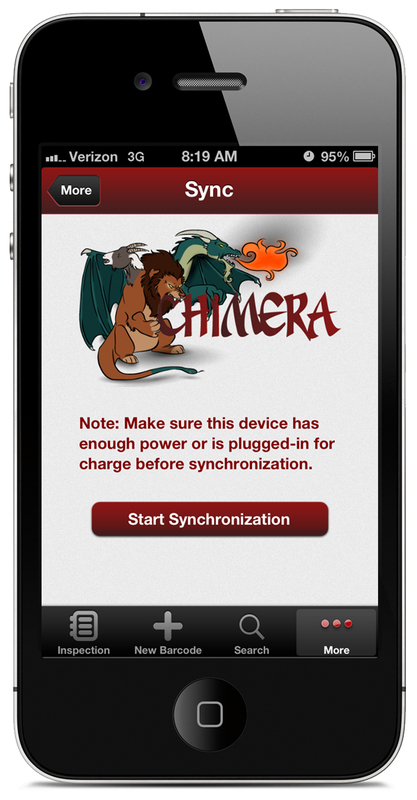 This one was a big problem with Chimera:FLS and an improvement for this app. The only way to universalize information from different inspectors is do an API using synchronous HTTP Requests. So inspectors must push the Sync button when they are back in their office where reliable internet connection is present. The API was created using PHP. The app also runs on iPod Touch. Below are some pictures found in some of UNLV’s hallways that this app is used for. What I learned by making this app. 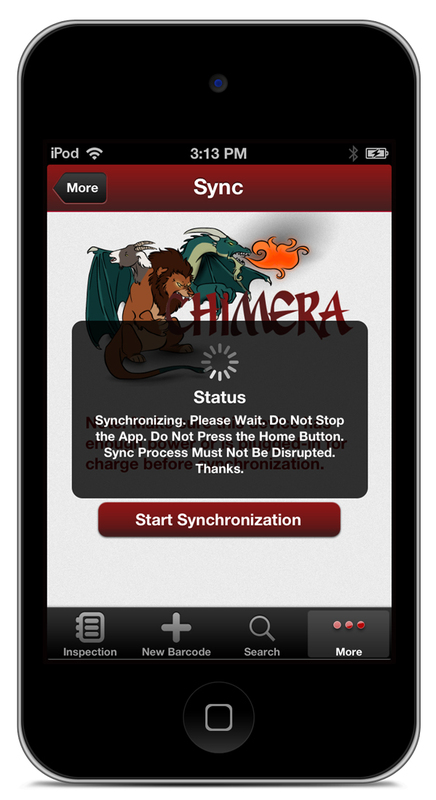 Due to the previous Chimera apps’ lack of reliability, non-existence usability and bad user experience, I realized that I needed to listen to users’ expectations and needs. I began to avoid random requests from end-users who didn’t know what they want and only asked for things they didn’t need. Most of what the end users ask for are either highly unrealistic or counter-intuitive to the goal and usefulness of the app. This app was the main reason that I got into professional app development. At the time (iOS6 ), cross-platform frameworks were only at their infancy. I didn’t feel that they were solid enough. I sought to challenge myself by learning Objective-C, Xcode and the Cocoa Touch Framework. But my job role at UNLV’s Risk Management Safety led me to making this app which lead me to professional app development! Lastly, I started to learn User Experience and UI Design. The images in this app were created through Adobe Illustrator and Adobe Photoshop. *The app was made from iOS6 and updated to work for iOS7 so the images can look a little different from each other. §This app was created for the Risk Management & Safety Department of UNLV, under the supervision of Robert Deaver. All copyrights and ownership are of UNLV’s. I was just the sole developer of this app. ±The pictures are taken as screenshots from simulators and/or devices.